Insects rely on their sense of smell to find food. To find a food source, an insect needs to separate odorants from different sources. This is because odorants distribute in turbulent plumes and plumes of different sources intermingle. We investigate how insects exploit the fine-scale spatial differences between odor plumes from different sources to separate them. Human smelling is interrupted by the rhythm of breath. Insects, in contrast, continuously sample the odorants in the air with antennae. Therefore, an insect's smelling experience might be more similar to our hearing experience, and the insect's odor source separation problem might be similar to our auditory source separation problem (cocktail party problem: how do we understand someone on a loud party?). Humans use short differences in sound arrival to separate sound sources. Correspondingly, insects use short differences in odorant arrival to separate odor sources (Szyszka et al. 2012, Stierle et al. 2013). Honey bees use stimulus onset asynchrony of just 6 milliseconds to separate two odorants (Szyszka et al. 2012). Collaboration: Ryohei Kanzaki (The University of Tokyo), Thomas Nowotny (University of Sussex), Yunusa Mohammed, Aarti Sehdev and Brian H. Smith (Arizona State University). Humans sniff to enhance odor perception. 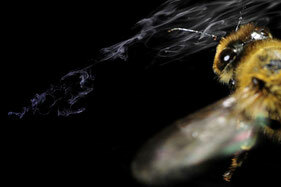 Similarly, insects enhance odor perception by flicking their antennae and maneuvering themselves through odor plumes. 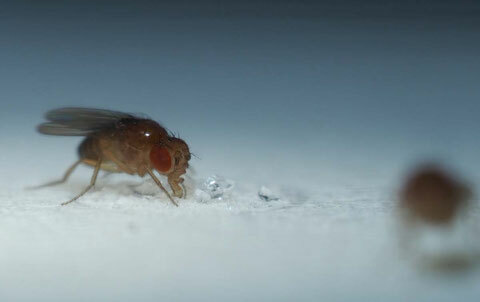 We investigate how insects use these active odor sampling behaviors to maximize information about the identity and position of odor sources. Efficient active odor sampling in turbulent plumes is supported by insects' fast smelling capabilities: Olfactory receptor neurons can respond to odorants within 3 ms, they can resolve odorant fluctuations at high rates (above 100 Hz) (Szyszka et al. 2014, Egea-Weiss et al. 2018), and olfactory neurons in the insect brain are sensitive to the temporal structure of olfactory stimuli up to 60 to 100 Hz (Stierle et al. 2013, Raiser et al. 2016). Antennal responses to the song “Biene” played with the odor delivery device (mean of 2 bee and 2 moth antennae) (Szyszka et al. 2014). During feeding, insects evaluate the quality of a food source and its associated risks. Food-evaluation involves associative learning during which odors and other sensory stimuli become predictive for the quality of the feeding site. We use naturalistic behavioral paradigms and neurophysiological approaches to reveal the neuronal bases of sensory memories and of higher order forms of learning. Insects readily associate odorants which co-occur with the food. But they also associate odorants which precede the food by several seconds, demonstrating a sensory odor memory that bridges past and present (Szyszka et al. 2011, Galili et al. 2011, Lüdke et al. 2018). Notably, insects’ time-bridging capability increases with experience, which could be explained by cognitive capacities such as attention or higher order learning (Dylla et al. 2013, Dylla et al. 2017).